Looking for a way to copy incoming email activities from Outlook Web App to Microsoft Dynamics CRM? Now if you’re using CRM Online and have installed CRM Online 2015 Update 1, you can use the new CRM App for Outlook to do just that. Note: CRM App for Outlook is a Preview feature. It isn’t supported by Microsoft at this time, and it’s only available in North America. Preview features offer you a chance to get an early look at new features and provide feedback. CRM App for Outlook is a lightweight app for Office that you can use together with Outlook Web App (included with Office 365) or Outlook 2013 (desktop app). When the app is installed, CRM data appears in context with your Outlook messages. 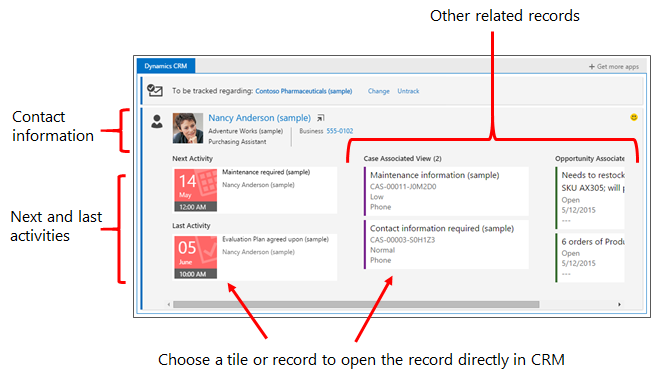 Preview information about contacts and leads stored in CRM. Find a phone number or company name for a contact or lead, preview the last and next activities for that contact or lead, or see other related records. You can open CRM records directly from the app to find or enter more detailed information. 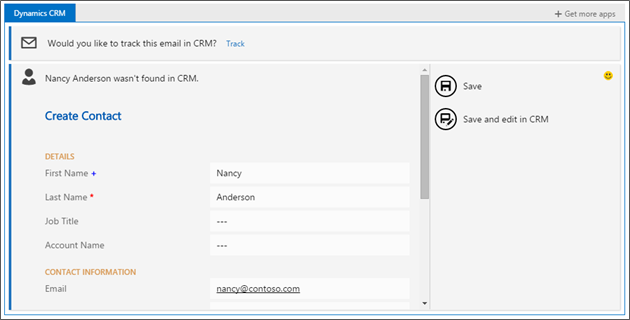 Track an incoming email message and (optionally) link it to an existing record in CRM. For example, you might want to link an email message to a specific account or opportunity. If a record doesn’t exist, you can create it right from within the app! You can also find out whether an email message is already tracked, and change the regarding record. Create CRM contact or lead records for people on the From list if they aren’t already included in the CRM database. You can also create new CRM records for any entity as long as the entity has been enabled for mobile and for multi-entity search. 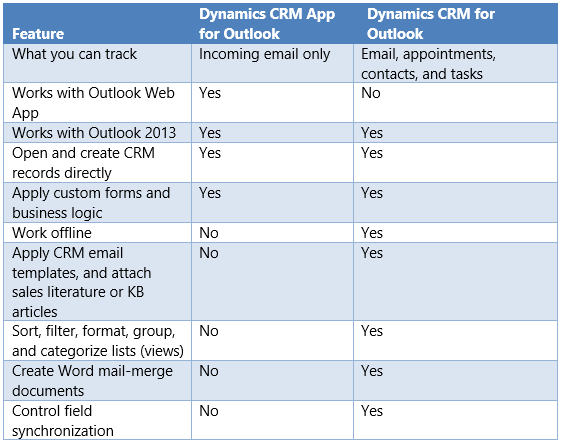 So how is CRM App for Outlook different from the CRM for Outlook add-in? Microsoft Dynamics CRM already includes a full-featured CRM add-in for Microsoft Outlook called Dynamics CRM for Outlook. With Dynamics CRM for Outlook (also known as the “Outlook client”), you can do all your CRM work within the familiar Outlook interface if you choose. You can even work offline with Dynamics CRM for Outlook. Dynamics CRM App for Outlook is a lightweight app that enables you to easily track incoming email, wherever you are.